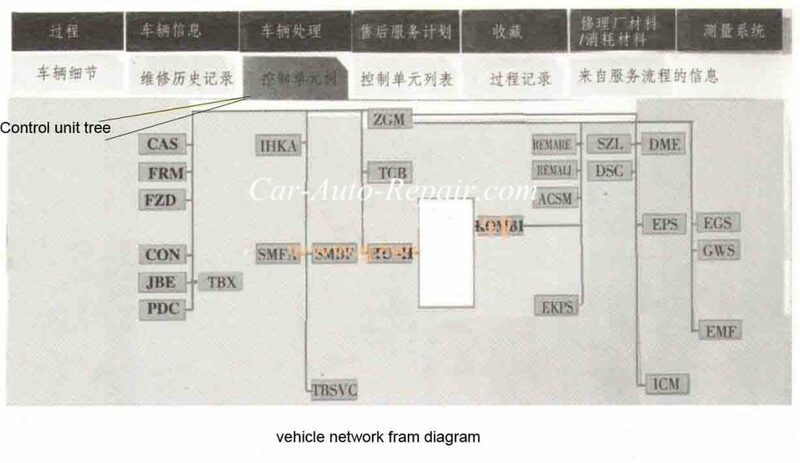 A BMW 525 F18 made 2015 N20 with 30 thousands kilometers,the owner described that remote fob can not open the doors,and only the left front door can be opened with mechanical key,power window switch can not lock and unlock the doors,instrument cluster doesn’t light on and can not start the engine. 1. Remote key can not unlock the doors,and only opened by mechanical key. 2. Power window switch malfunction:can not lock and unlock. 3. Instrument cluster black screen,it displayed a “P” light when press the ignition button. 4. Can not start the engine even close the key to the steering column. 2. 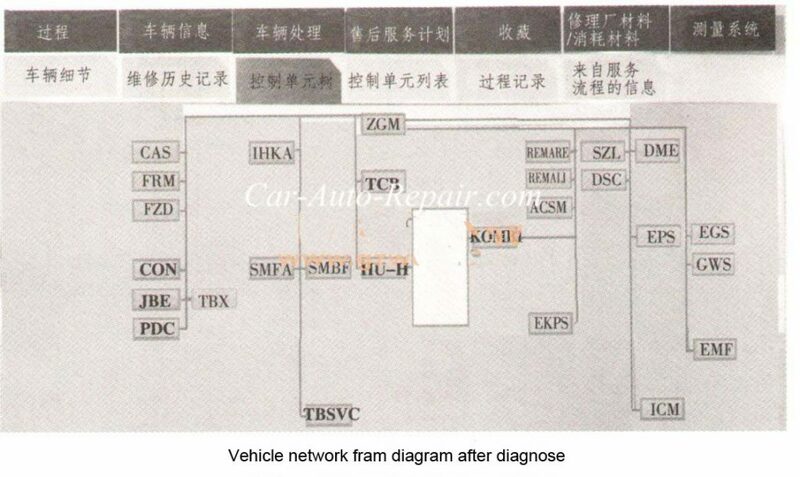 Check the network diagram,found the communication faulire of K-CANS and MOST. And when the MOST working,it is activated by K-CANS,so it is most likely that K-CAN2 trouble result system trouble. The sum voltage is 4 v,but 5 v is normal. K-CAN2-H and K-CAN2-L,the resistance value is 20Ω,it means that there occur short circuit on K-CAN2,K-CAN2-H adn K-CAN2-L.
3. Disconnect the all modules on the K-CAN2-H-L circuit,then detect the resistance value was still 20 Ω.It suggested that the moduels is work correctly,the short circuit occured on the wire harness. 4. 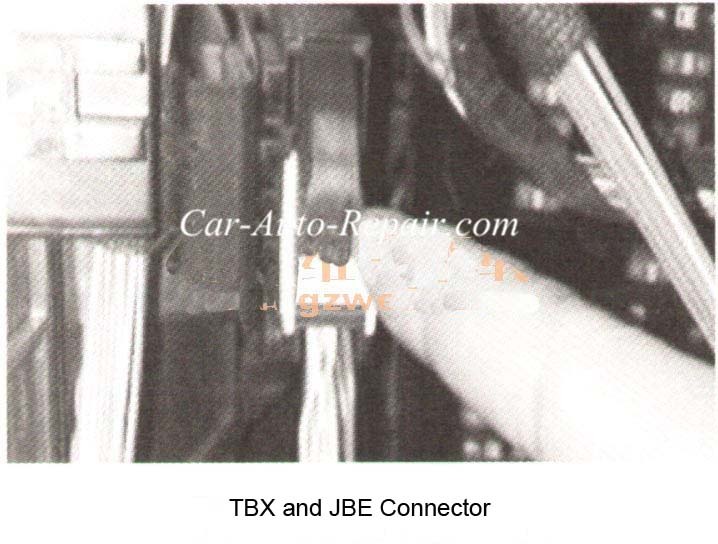 Found one of K-CAN connector is front of power box.Disconnect the connector,and disagnosed vehicle again and found the module behind JBE on K-CAN were failure to communicate.And technicians determind that the short circuit occur on the TBX and JBE. 5. Disassemb the TBX and JBE wire harness and found TBX wire harness was damaged and two wires are shorted together showed as below picture. Separate the two wires and fix the wire harness. Trouble symptom disappeared,the engine can started normally and power window swith work correctly,remote key function get right.